Our application will be made up of three screens. We need to plan where we are placing our app. We can do as we like, but for this article series and for the sake of continuation, a very simple and “integrated” setup will do. First we’ll create a basic Laravel Blade view, named index.blade.php, that will “host” the app. Frontend dependencies will be handled by Bower, which is already included in Homestead Improved. Another good reason to switch to VMs, if you have not already done so. We already know the first three elements: jquery, bootstrap and angular. The fourth, angular-route, will be used as a router for our single page application. The fifth, angular-local-storage, will be used to locally store our authentication token. We will use the last one, restangular, to create a “resource” in Angular that will communicate directly with our server via HTTP requests. Other entries can be deleted. Note: don’t confuse the routes.php file with the api_routes.php file. Let’s build the Blade template we are going to use and create a new file named index.blade.php in resources/views. In this file, we can find everything we need. We will start with the first two screens: the Login screen and the Signup screen. This will involve our angular-router. The basic principle is very similar to the Laravel routing process: we assign a certain “screen” to a certain route. For every single screen, we are going to build an Angular controller. This controller will handle every logic operation, leaving the presentation responsibility to the view. We are defining the routing structure of our application. As you can see, we have three possible routes. Declaring the module, at the top of the file, we are injecting two dependencies. The first one is ngRoute, used for the routing functionality. The second one is bookWishlistAppControllers, the module that is going to contain all our application controllers. Let’s create another file in the same folder, named controllers.js. As we can see, they are all empty right now. We will fill them out later. Right now, we just want to test our routing system. Let’s create another folder in the public one: partials. We’ll place three files inside: index.html, login.html and signup.html. Inside each of them, just place some demo text for now. 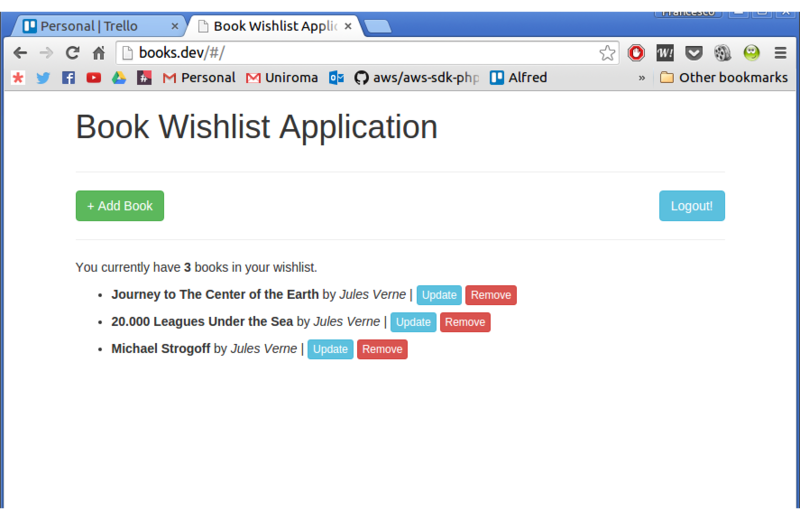 We added the ng-app="bookWishlistApp" attribute in the html element, and the ng-view attribute to a new div element. This will be the “container” for our partials. 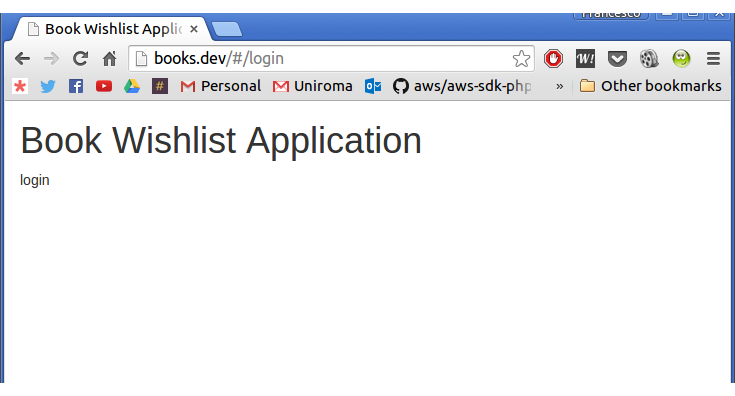 lines, to load the main app file and the bookWishlistAppControllers module that will be injected as a dependency. Yay! Our routing works perfectly. In order to build the Login and Signup screens, we will encapsulate some user access related logic in a separate userService. Obviously, we will have to add this file to the main blade view as well: resources/views/index.blade.php. Now that we have our service, we can start with the signup screen. It will be a very simple one: just a welcome text, three text boxes and a submit button. With the ng-click in the button, we will call our controller’s signup() method. First we made the signup method. Due to this being an already very long tutorial, we skipped form validation. The only thing it does is call the signup method of the userService we just made. If everything is ok, it shows an alert and redirects the user to the main application screen. Note: Don’t forget that the signup method already saves our token in the storage. This is why we are redirecting the user immediately if the operation is successful. If a token is already present, the user will be automatically redirected to the main page. Once again, we used the userService login() method. If everything goes well, the user is redirected to the main page. Otherwise, an error alert is shown. The last thing we have to do is to implement the book management part. We will do everything in the MainController, from showing the list and the creation process, to update and removal. Again, we will build a service for everything we need about books’ persistence – something like a repository. In public/js/services.js we add a new service: bookService. Note: Don’t forget to add restangular as a module dependency. As we can see, Restangular was used to deal with the API endpoints. To be more precise, we have five methods. In this service we are also dealing with headers and their settings, using the getCurrentToken method of the userService we already have. Note: a thing worth noting is the presence of a custom update method. Usually, the update flow is made up of two steps. Getting the entity, and then updating it. We already have a getById method here, so we don’t need the get part because we already know the book id. By using the customPUT we managed to build an “alternative” version of the update procedure, without the need for an extra call to the API service. We added two methods: logout calls the one with the same name in the userService, and refresh. The latter calls the getAll method in the booksService. Then, it assigns the result to the $scope.books variable which is already bound to the view. If something goes wrong, an error is displayed. Now we have to implement the book creation functionality. For this purpose, let’s return to our public/partials/index.html view. Let’s add a modal that we will use to add a new book, and a button to toggle it. Our controller grows: we can see the create, and the currentBookReset method that resets all the scope variables. The create method obviously uses the create method of the bookService. The app should now already work well! We still have to implement the updating and removal of books. Let’s start with the easier one, the remove method. The bookService will do its job. If something goes wrong, an alert will be displayed to the user. The load method will retrieve the book data from the API, and show it in the modal. Then, after the edit procedure, the user will click on the “Save Changes” button, which will call the update method. This final method will call the bookService accordingly, storing the edit using the APIs. Our controller, in its final form, will look like this. Our application is now complete… and we can use it! Time to store tons of books. Yeah, I love Jules Verne. In this series, we used two separate technologies to build a complete (and complex) application in a really easy way. Thanks to some tools like the Laravel API Boilerplate and Restangular, we focused almost entirely on the real business logic instead of wasting time on bootstrapping. In this part, we took a look at implementing an Angular front end for our Laravel API back end, going from nothing to a fully fledged app. Obviously, the journey doesn’t end here: as an exercise, my suggestion is to implement a mechanism to check if the token has expired, and create another one to refresh it. In future posts, we might look at various different JS frameworks to achieve the same thing, and judge which one is the simplest. Any suggestions on which ones we should try first?